With a fan base that rivals those of other Green Party members (Kermit the Frog, the Jolly Green Giant, Gumby, Shrek), the Marvel Comics creation The Incredible Hulk has lived long and prospered, having made his comic book debut back in 1962 and never straying too far out of the comicdom spotlight. And during a period in which other popular superheroes flamed out when they were turned into flesh-and-blood characters and thrust into their own short-lived TV series (The Amazing Spider-Man) or cheesy motion pictures (Captain America), the Hulk overcame the comic curse by starring in a popular TV show that cast Bill Bixby as scientist David Bruce Banner and Lou Ferrigno as his raging alter ego. Unfortunately, this moderately engaging series, which ran from 1978 to 1982, was followed years later by a string of wretched TV movies that, for starters, grotesquely re-imagined the regal hero Thor as a frat boy party animal and (mis)cast wimpy Rex Smith as the way-cool blind crimefighter Daredevil, a role played more recently by Ben Affleck. 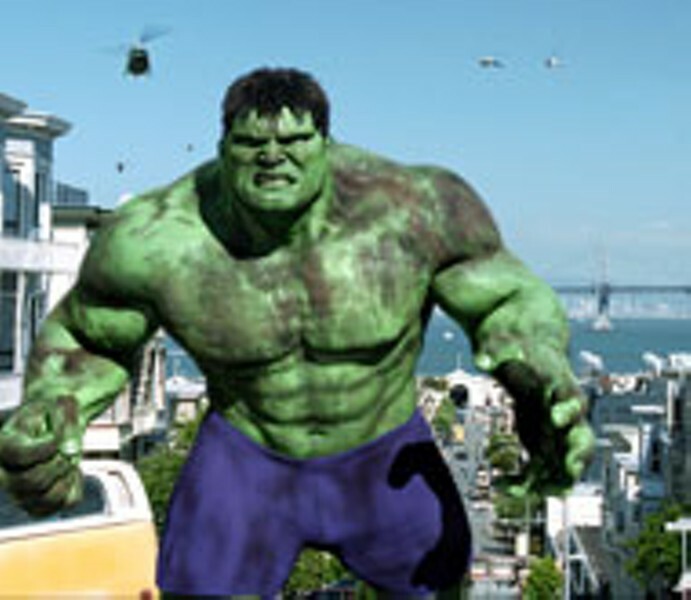 Still, given the current boom in super-flicks, every hero will apparently have his day, and so we now get Hulk. In their first film since their international triumph Crouching Tiger, Hidden Dragon, director Ang Lee and writer James Schamus (co-scripting with Michael France and self-acknowledged comic fanatic John Turman) have created a motion picture that unwittingly condescends toward the comic book medium even as it's trying to elevate it to another plateau. Comic books have always been dismissed by a large block of people as nothing more than juvenile escapades with no link whatsoever to the real world, when nothing could be further from the truth. On the contrary, comics have often tapped into the national zeitgeist as well as any other art form -- for instance, the Spider-Man series tackled drug addiction in the early 70s in a manner that drew acclaim from all corners -- while such titles as The Fantastic Four, The Uncanny X-Men and, again, The Amazing Spider-Man spent plenty of panel time with their heroes out of their costumes, battling not megalomaniacal villains but everyday enemies like poor finances, relationship woes and even the common cold. This effortless affinity between hero and reader appears to have been lost on Lee and Schamus. Obviously wanting to create something more "meaningful" than a mere summer popcorn flick, the pair have decided to add import to their assignment by making a movie that's as much about family dysfunction and harnessing the essence of one's untapped potential as it is about a guy who turns into a monster (indeed, we're a full 50 minutes into this 140-minute feature before the title behemoth even appears). That's all well and good, but in trying to come up with something of substance, Lee has largely left out the sharp sense of humor and gee-whiz level of excitement that have ignited the best of superhero cinema, not grasping that these aren't hindrances on the road to respectability but rather the very things that drive the journey. Certainly, the oft-repeated theme of last summer's Spider-Man, "with great power comes great responsibility," may sound like fortune cookie fodder, but because it was nestled within Sam Raimi's playful direction and Tobey Maguire's warm performance, it resonated with viewers in a way that Hulk's gloomy philosophizing doesn't. The central plot is certainly functional, giving some interesting spins to the original story created by Stan Lee and Jack Kirby back in "62. Bruce Banner (Eric Bana) is a research scientist whose emotions are so shut off that even his girlfriend, fellow scientist Betty Ross (Jennifer Connelly), has had enough. But it turns out that his moodiness can be attributed to repressed memories from his childhood; all involve the warped machinations of his overzealous father, a man so consumed by his scientific research that he had conducted experiments on himself around the same time his wife was pregnant with their child. Thirty years later, the sudden reappearance of Bruce's dad (now played by Nick Nolte) coincides with a lab accident that should have left Bruce dead but instead serves as a temperamental trigger, a way for this mild-mannered man to release the raging brute that resides within him. A disheveled Nolte looks like he wandered onto the set mere moments after having had that notorious police mug shot taken, but at least his lunatic act provides brief respites from the snoozy leads. Connelly, in her first film since winning the Oscar for A Beautiful Mind, struggles mighty hard to bring any sort of an edge to a rather anemic role, but Lee's subdued direction lets her down. And if Eric Bana is hoping for the same sort of career jumpstart that greeted fellow Aussie Hugh Jackman after the latter's work as X-Men's Wolverine, he's probably deluding himself. Bana's performance is monotonous even beyond the low-key demeanor of the role -- he's a human flatline. Of course, the real star of the show is the not-so-jolly green giant, a role that isn't played by an actor but instead springs completely from the efforts of the computer gurus at Industrial Light & Magic. Their results, sad to say, only earn a mixed review. In close-up and midrange shots, the Hulk looks fine, and it's easy to believe this CGI creation is actually inhabiting the same space as the other actors (ignore the fact that he looks like a bloated Joaquin Phoenix getting ready to upchuck; I'm sure that's just a coincidence). But in the distant shots in which the creature is shown running or jumping or beating up defenseless tanks, he looks absurdly fake, so much like a video game icon that you half-expect the action to suddenly stop and the words, "Game Over. Please Insert 50 Cents To Continue," to appear over the frozen images. There are occasional pleasures here and there. Stan Lee and Lou Ferrigno appear in amusing cameos, and one of the central characters (no fair revealing which one) ends up imbued with the awesome powers of The Absorbing Man, a super-villain who first tangled with the comic book Hulk back in 1977. Best of all, though, is Ang Lee's visual scheme, which often tries to provide the cinematic equivalent of a comic's splashy color panels (competing screen images are boxed apart, shuffled around, magnified). These are about the only moments in the movie that make us feel like we're actually flipping through a comic book rather than lumbering through an arid college textbook.